It is that time of year. The time we remember earlier holidays and departed relatives. Any connected sadness has long settled into a fondness for the small glimpses through blurred windows of how I remember a time, place and person. The following was a writing prompt, something about doing the unexpected I think. Really can’t remember exactly but it is all about being an artist and working with textiles to tell a story. I cut into the fabric and my scissors gnaw at the yarns she used for getting her daisies just so. Long white embroidery stitches splaying out from a center of bright yellow French knots. It seems brutal at first, destroying my mother’s sewing. But I only give it a moment’s thought before continuing with my sharpest pair of scissors. Is this the wrong thing to do? It is probably the last bit of her sewing that I have. Should I keep it for a little while longer? Of course I know I am going to do it – cut the entire panel from the daisies to the fields of grass in the background. Cut it all into jagged squares with threads of linen sticking out along the edges and colored yarns flopping about. Some falling to the floor. I pile the pieces up according to their size and marvel at how many there are. The blank canvas waits on the easel as I take a moment to recall her sitting there by the lamp. She rummages through her yarn bag for just the right color (a color I am about to destroy) and threads her needle. Slowly pushing in and out she builds an image that I have not hesitated to cut to pieces. I select the fragments at random to dredge into the thin white paste of gesso – then press them onto the canvas. Moving my fingers much like she did – getting the threads just so. It is difficult to jury a fiber exhibit. There are so many variables of the word “Fiber”. And so many ways they are put together. 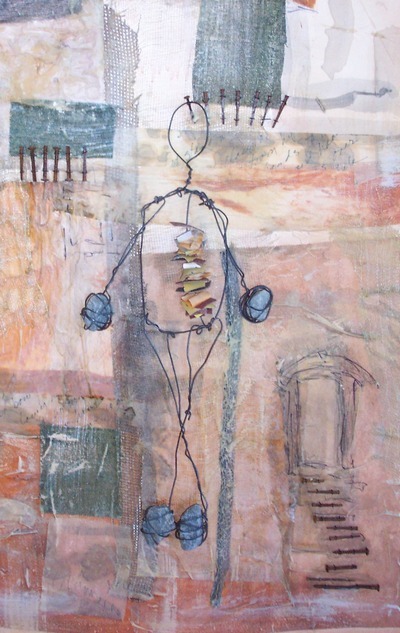 One of the things that are most difficult in jurying a fiber exhibition is “mixed media”. It has become almost the norm in art materials and where is the line drawn in mixed media or mixed fibers? Does the glue show? Wait, maybe the glue is supposed to show. Maybe that is part of the statement and intention of the artist. No, not always…..the piece the juror is looking at might just not be a commentary on the haphazardness of attachments, the visible form of connections, holding relationships together…..maybe it is simply sloppy workmanship. I remember writing a letter to Handwoven magazine in the early nineties saying I did not want to be labeled a weaver, but a fiber artist. One of the responses was written by a purist that said there was nothing wrong with being called a weaver and likely I just wanted to dabble in doing poor work with even poorer materials. He might have been right. Maybe I was just tired of having my weavings judged by the standards of quality craftsmanship. When told I made a pretty sorry looking basket, I said maybe it wasn’t about function but about “containment of space.” And maybe she was right. I just made bad baskets. When Lillian Elliot did not accept one of my baskets into an exhibit on the basis that “it simply did not fit the show”, I was actually grateful she made that choice when I saw what she did accept. Then again if we limit ourselves with the traditional craft of fibers, we might as well be just looking at a textbook of techniques and materials for functional cloth and containers. This is not necessarily what brings the general public into an exhibit. The expectation when we see the words, “Exhibition” and “Gallery” is that here is going to be something new, something innovative, something not seen before. And most importantly make the viewer look at textiles in a whole new way. Not only that, but a good exhibit of any kind, should drive all of us makers back into our own studios with new vigor. 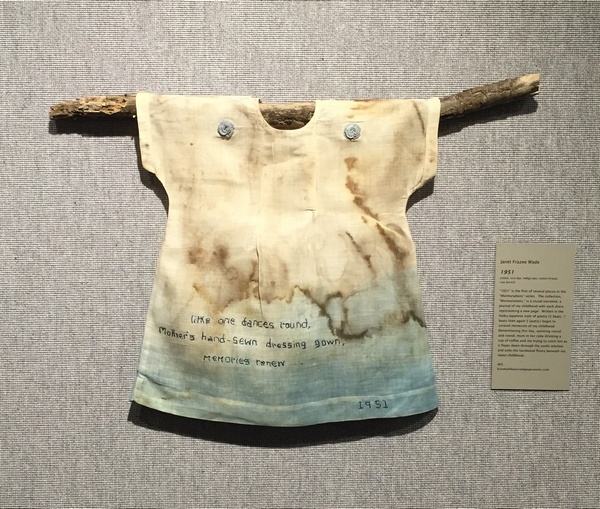 We will look at the work displayed and say things like, “I didn’t think of using those colors to talk about grief”, “It did not occur to me that something so small could say so much and so clearly”, “I had no idea that a simple woven dish towel could be so lovely”. And of course the problem we all can suffer from in the world of making things is, when is too much too much. When do we stop looking at everyone’s work, take every offered workshop, view every “you-tube” tutorial and tell ourselves, “I can do that.” And then proceed to do just that. Put everything we know into everything we do. In the process we can easily lose our own voice, lose track of our intention. Surely our intention is not to show how much we know but to share an idea fixed in a visual form. That to me is what art is, an idea fixed in a visual form. The intention of an artist is to do exactly that. The intention of a craftsman is show a quality made piece of workmanship that takes knowledge of materials and technique to execute. One is not superior to the other. They are simply different and therefore pull the viewer in different directions of appreciation. The problem in jurying a fibers exhibition is just that – fiber! It is cloth, paper, thread, felt, basket materials either harvested or purchased in coils and bundles. It is easily layered, woven, stitched and bound. It is enormous like the installation works of Magdalena Abakanowicz, Sheila Hicks, or the small and intricate embroideries of Rene Adams or Ray Materson. Fiber is the perfect medium for statements on the human condition because it can be cloth, clothing, filled with the meaning of those who wore it. I am thinking of the paper made by John Risseuew from the collected clothing of ravaged women in Bosnia and once formed into sheets used to make a statement on war and consequences. Or it is the bedspread of your youth that you turn into a covered box in which to present your much despised and freshly shorn dreadlocks to your mother. A young student I had at Arrowmont did this. And now there are books – the artist book. It attracts fibers like a magnet. Here is a perfect venue for the page, the illustration, the text and form to house it all in. And the viewer is hopelessly caught within the pages…..they have to touch it to see it in its entirety. And there is something very unique in that experience. Those critiquing my graduate work about the men in my community had to touch their clothes, their handkerchiefs, their rags, their very essence used in fragments across the pages of who we were to each other and how they mattered to me. Cloth is powerful stuff! There are just so many ways to use fiber. Aside from fixing ideas in form, there is the very function of what it can do – linens, baskets, journals waiting for entries; not to mention the pieces made with the intention of just being beautiful and decorative, such as art to wear clothing, jewelry, rugs, and wall hangings. It is simply too much at times. I can’t think of another medium that spreads itself so far across function, decoration and art. And then we have to jury an exhibition…a fiber exhibition. We have to look at what is there to jury. Then we have to see how well it is done. Does it follow the maker’s intention? Does it say too much? Is the maker appearing to be enamored with the material more than what they want it to say to the viewer? And on and on and on. And unfortunately it is all subjectively up to the juror. One person’s viewpoint. One person who may or may not have totally missed the point. My suggestion would be to limit fiber exhibitions to themes, size, materials, etc…..anything to make the final show more comprehensive to the viewer, less about what fibers are capable of and more about what fibers can be specific to. And then of course have more exhibits based on those chosen themes. Below is the Best of Show titled, 1951 by Janet Wade. 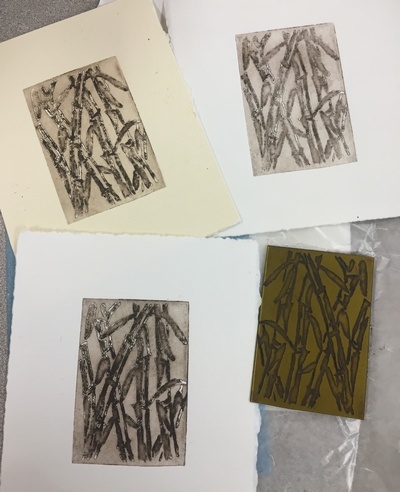 This past week I was being a student of printmaking taught by Mary Quinnan Whittle. Her delicate copper plate etchings are lovely and this was the first chance our schedules coincided. The monotypes above I learned how to make on the first afternoon of class. 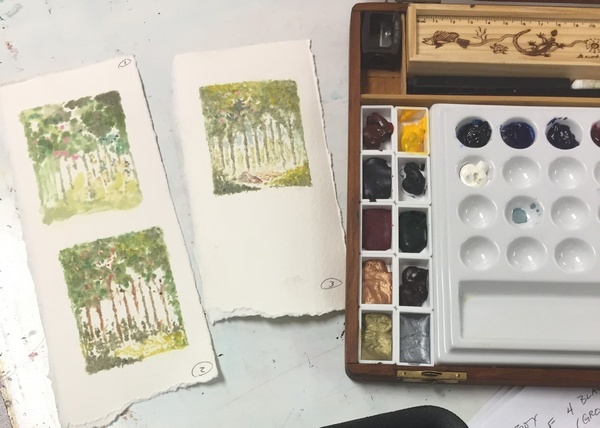 The 5″ x 7″ plexiglass plate was covered with a thin layer of oil based sepia ink and then I pulled off the ink that was not relative to the image I wanted. 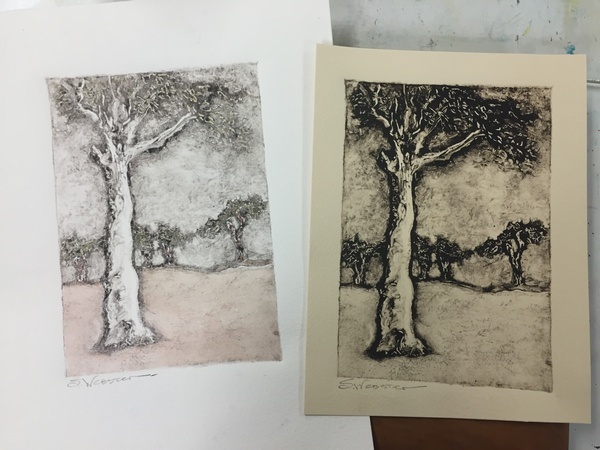 What I wanted was a print of a ghost gum, a ghost gum inspired by a photo I took in Alice Springs, NT many years ago. I loved this and used the ink left on the plate to create a ghost print that could be watercolored. There is something about an image appearing out of nothingness that is very appealing. Like woodblock carving it is all about finding the light. In the morning of the first day we learned how to make gelatin plates with the addition of glycerin. It was amazing how firm and long-lived these plates can be. I tried Mary’s suggestion of making a monotype using watercolors on the plate. I made this image three times because there was enough of the color left on the plate to see where to redo the image. The effect of blurriness when the hand presses the paper into the squishy gelatin plate is interesting but not where I would like my prints to go. But great fun to teach students in the Experimentation with Materials class because now the gelatin plates will be so much easier for them to use with this new recipe. Day two was making solar plate prints. I had done this with Susan Baran in Australia a few years ago and was so intrigued with the results I got. But plates are expensive so I did not return to it. Mary’s class was a good time to take another look. The bamboo image was created by drawing with white gouache and a brush on a frosted glass plate. I put several layers of paint on but the solar transfer of the bamboo lacks clear edges and again a bit blurry for what I would like. Good experiment though. 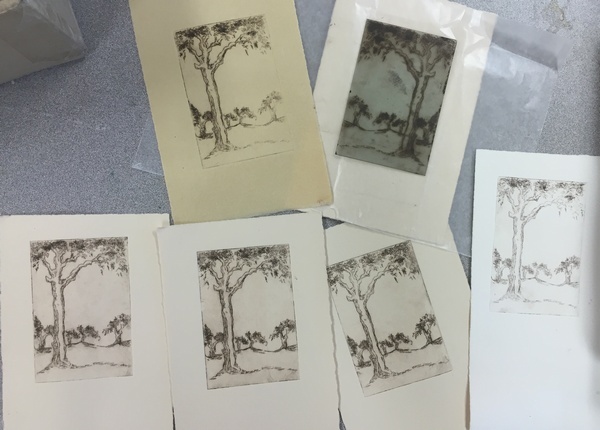 On the third day I am back to the ghost gum and trying a dry point etching on a student grade etching plate that I purchased from Melbourne Etching Supply in Melbourne, Australia last spring. There is a limit to how many times a mylar plate that is dry pointed can go into the press. What holds the ink here is the burr created by scribing into the plate and when that burr is worn down the image will continue to get more blurry. But it is a quick and no acid needed technique. I think it also lends itself to being tinted with color, just because of that softness that occurs in the fifth print onward. The afternoon of the third day I am still working with the photo and earlier monotype print of the ghost gum. 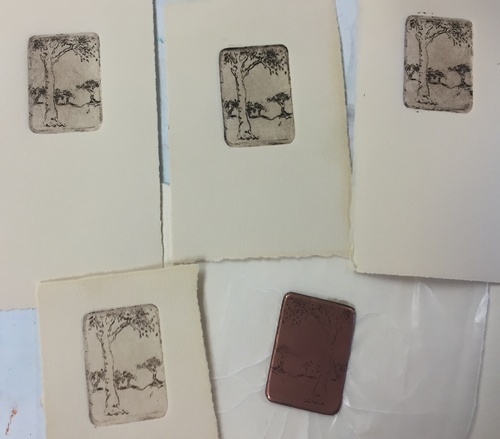 Now it is my first copper plate etching that I carve the image into. The plate is only about one by one and one half inches. This was fun and Mary was smart to only have us start with such a small copper plate just to get something that could see completion. I am also staying with the sepia oil based ink. I can now print several of these on my own press. On day four I took a photo with my iphone into the woods near the studio. Mary let me have a four by five inch copper plate to see if I could get the feeling of being there onto the plate. It took three times into the etching bath to get the image I wanted. Mary kindly left a book of Rembrandt’s etchings on my work table so I had the best of inspiration while working. 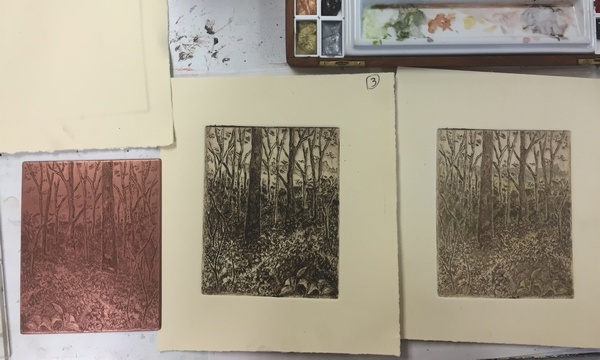 Here is the plate, the final print and a ghost print that has been water colored with the subtle shades of fall. Some of this work spilled into the fifth morning. But there was still time to do another copper plate. 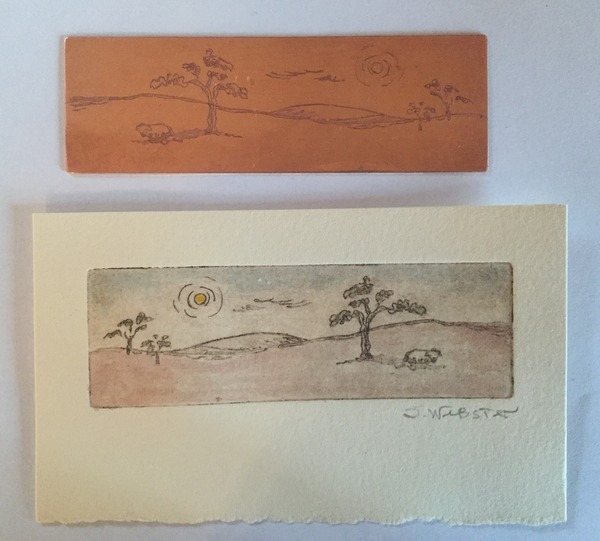 You can see two plates here because the first one on the top was not covered properly with the resist and the etching appeared in places that could not be incorporated into this tiny image (1″ x 4″) of the Australian Outback with a small sheep in the shade of a tree. I had to carve a second plate and etch it in slow stages to get what I wanted. Below you can see the two plates. 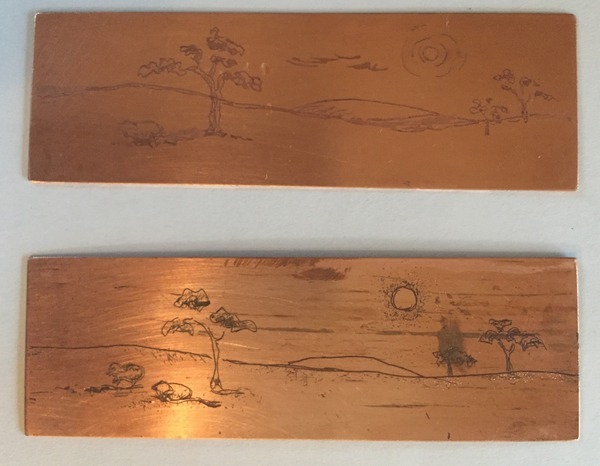 The one on the bottom has mistakes in the etching and I eliminated one of the sheep in the second plate above. Time is becoming quite dear by now and I need to finish up. This is a print that I water colored just before writing this blog entry. Anything I want to add to this will have to be done by dry point etching as I do not have access to an acid bath and do not want to get involved with that right now. The class was everything I expected and more. Last night I slept a full ten and a half hours and I think that was partly due to the exhaustive clean up necessary in a class that was as open as Mary’s. 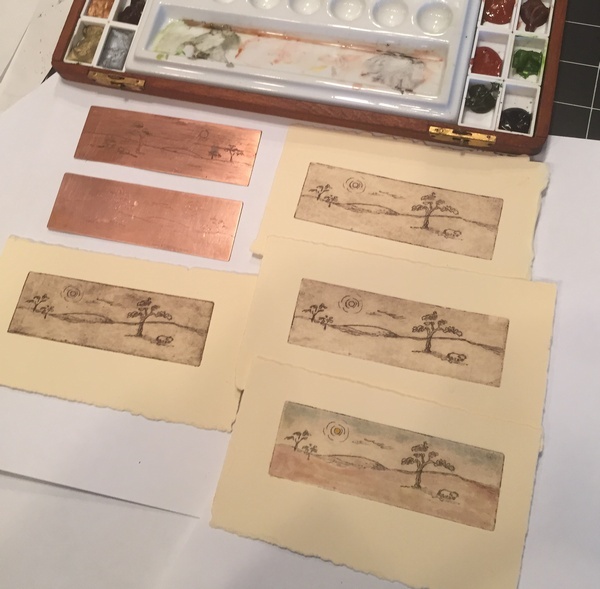 I would have liked just the etching copper plate part for a full five days but took advantage of learning anything else she was tossing out there. It was a great chance to see how others choose to learn and participate. I hope to get another chance to work with Mary and two other enthusiastic students I met this week.